Some days and weeks are like a roller coaster ride. Somehow, I’ve never quite learned how to deal with the sudden shifts in mood, perspective and direction that life can throw my way. My instinct is to crawl under the bed covers and sleep, let my unconscious mind create a workaround solution to the juxtaposition of happy and sad, or joyous and melancholy. Reality almost always dictates that I stay out of bed, fully dressed, interacting with the real world. I simply have to put on my game face and keep moving in the various directions the tracks take me. I remember a carnival ride growing up called the Wild Mouse, or something like that. Scarier than the full-sized roller coaster, each car held only two people tightly scrunched and belted down into tiny seats. At first the contraption moved the pair of riders slowly, haltingly upward, climbing higher and higher, providing a great view of the theme park and everything around for miles. 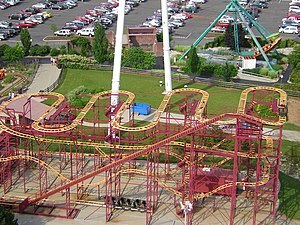 Then suddenly the ride would shoot forward toward the outside edge of the track with a near certainty that it wouldn’t make the sharp ninety degree turn ahead. Sure of my imminent launching out into the open air and down to the asphalt below I would close my eyes and try to hold the lurching terror of my stomach down. Somehow, miraculously, we’d make the turn without being thrown from the mouse shaped car only to careen up or down or out or around in a crazy mouse maze of speed and height. Give me a roller coaster any day of the week. I read a book a few years ago called “Who Moved My Cheese.” It’s about resilience and the ability to adapt and go with the flow. At least that’s the message I took away from it. My friend Kathy pointed out to me the other day that I’ve become skilled at moving with my cheese. In my personal mouse maze of life I’ve somehow managed to not get too lost or jaded or discouraged for too long. Once in a while, in the middle of some incredible happiness and some of life’s best moments, life throws out rotten tomatoes. Wrapped up in the revelry of good stuff, I’m always caught off guard by those not-so-happy zingers. Put on my game face. Steel myself. Hold on for dear life. And enjoy the moments that I can. Even when things are tough, life is still filled with wonderful things. If I can remember that, then I am blessed beyond counting. The idea was posed to me lately that anything that brings you closer to God is a blessing. so I guess even “in your face” difficulties could fall into that category if you let it be such.